Elle was sighted on the set of “Molly” once again! 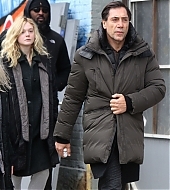 She was filming what seemed like a… slightly dramatic scene with actor Javier Bardem, and our gallery has been updated with the images. Elle talked to Vogue about being the star of Miu Miu’s latest fragrance, called Twist, wanting to make the movie “Teen Spirit” and why she’ll never have bangs. You can read the interview below! I’ve also updated our gallery with new images from the campaign. Elle Fanning’s role as a Miu Miu muse has been well documented. The 20-year-old first appeared in the brand’s Spring 2014 campaign and recently made her catwalk debut, opening and closing the Fall 2018 show. Now, Fanning and Miu Miu have reached another milestone: The actress is also the face of the brand’s new fragrance. She is dressed in a coral Miu Miu shift dress, her willowy 5-foot-9 frame tottering above silver glitter platform sandals that she’s paired (rather ingeniously) with mustard-striped ankle socks. Fanning resembles a very tall fairy; it’s not just her wide eyes, pert nose, and charmingly mischievous grin. It’s her mien—a girlish exuberance (her phone case is emboldened with the word “Rah!” in pink cursive) married with the assuredness of an old soul (she uses anachronistic terms like “cheeky”). To meet Fanning, who followed sister Dakota into acting at the tender age of 2, is to understand how she won the role of a Disney princess (Maleficent) and why designer Miuccia Prada keeps tapping her for projects on behalf of Miu Miu, the quirky-cool little sister of Prada. “It really speaks to my personality—cute and imaginative but still sophisticated,” she says. Our gallery has been updated with several images of Elle Fanning for Miu Miu! These are from 2018 campaigns that we had been missing – such as Other Conversations, Miu Miu More, and Fall/Winter -, as well as the new 2019 fragrance campaign Twix. A new interview with Elle for Coveteur was released yesterday! She talks about “Teen Spirit”, being the face of Miu Miu and taking Uber rides. Elle was sighted on the set of “Molly” for the first time today! The images are now up in our gallery. Elle was sighted a few times in New York City this past week, and our gallery has been updated with the images. She seems to be in the city to film “Molly”, a movie with Salma Hayek, Javier Bardem and Laura Linney, directed by Sally Porter. Hey guys! I hope you’re having fun this Holiday season! ♥ I’ve been away lately, but I finally managed to squeeze in a few gallery updates that you might enjoy. Elle was sighted this month arriving at LAX Airport and shopping with her sister Dakota Fanning, and both sets of candids can be found here. Miu Miu, the high fashion brand she’s been posing for since 2014, released a Holidays 2018 campaign called “Famous Cats”, and a few pictures of Elle’s promotional photoshoot can be found here. 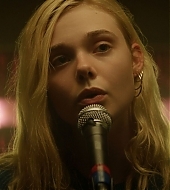 The movie “Teen Spirit”, starring Elle, is set to premiere in the United States in April, and you can watch the official trailer below. Promotional stills of her can be seen here, including a few I added earlier today. I have finally found some time to watch the movie “Mary Shelley” – which is now on Netflix in many countries – and I absolutely loved it. It is honestly one of my favorites of Elle’s now, and I hope you guys watch it when you have the chance. Moreover, I’ve gotten my hands on a copy of “The Vanishing of Sidney Hall”, so you can expect screen captures of both movies to be added to our photo archive soon. According to Variety, Elle is set to start in an upcoming Sally Potter film alongside Javier Bardem, Salma Hayek, Chris Rock, and Laura Linney. Potter previously directed Elle in “Ginger & Rosa” (2012). Production has begun in Spain on Sally Potter’s untitled family drama, starring Javier Bardem, Elle Fanning, Salma Hayek, Chris Rock, and Laura Linney. The story is described as a chronicle of a wild day in the life of a man on the edge, held together by the unconditional love of his daughter with Bardem and Fanning in those roles. Hayek will portray Bardem’s spouse and childhood sweetheart. The film will also shoot on location in New York in January. HanWay Films and Bleecker Street have partnered to jointly acquire worldwide rights. HanWay Films will handle the international sales and distribution and will commence sales at the upcoming European Film Market at the Berlin Film Festival. Bleecker Street will distribute the film in the U.S.
Potter’s long-time collaborator Christopher Sheppard — whose credits include “The Party,” “Ginger & Rosa,” and “Orlando” — is producing through Adventure Pictures. The film was co-developed by BBC Films and the BFI and is funded by HanWay Films, Bleecker Street, Ingenious Media, BBC Films, the BFI (awarding National Lottery funding), Chimney Pot Sverige AB and Film i Väst. We have a release date for Teen Spirit!… Sort of. The musical drama premiered at TIFF a couple of months ago, and was acquired for distribution in the United States by Bleecker Street, which has partnered with LD Entertainment to release the movie in the Spring of 2019. The news comes from Variety. The film, which is Max Minghella’s directorial debut, follows a shy teenager living in a small European town who dreams of pop stardom as an escape from her dismal surroundings and shattered family life. With the help of an unlikely mentor, she enters an international singing competition. The film also stars Rebecca Hall, Zlatko Buric, and Agnieszka Grochowska. “Teen Spirit” was produced by Fred Berger (“La La Land”) and executive produced by Jamie Bell. Interscope Records, which handled the soundtrack on “La La Land,” co-produced with Automatik and Blank Tape, and will release the official soundtrack featuring contemporary pop songs. LD Entertainment bought the rights from the producers during the Toronto Film Festival. The film’s U.S. deal was co-repped by CAA and Mister Smith Entertainment, which is also selling “Teen Spirit” internationally and co-financing.